While being sponsored, this content is not biased by money. While it is usually not my attitude to rant on products publicly, it is also not my attitude to say products are good if they aren’t. This also applies for this post. Startapp – you might have heard of it or seen it on the top right banner of this blog. Startapp is an enabler of android monetization that offers an alternative to common banner ads by, in my opinion, a more intrusive way of advertisement. Startapp is, according to AppBrain, number eight in the ranking of the most used ad networks on Android worldwide, with 1.84% of all apps. According to them, they are currently used by 19,000 apps with a total of ~600 million downloads. 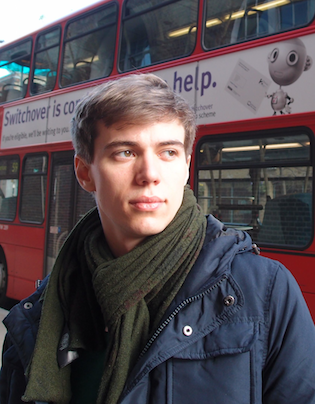 Startapp essentially offers three ways of monetization, by integrating their SDK into one’s apps, by referring other developers that then use their SDK and by exit ads. Integrating the Startapp SDK enables monetization on a pay-per-install base by advertising on the user’s device. For this way of monetization, two options are offered: Full and partial integration. The partial Integration will setup a 1×1 widget on the user’s home screen, imitating an icon. Furthermore, the homepage of the phone’s browser will be set by the SDK. 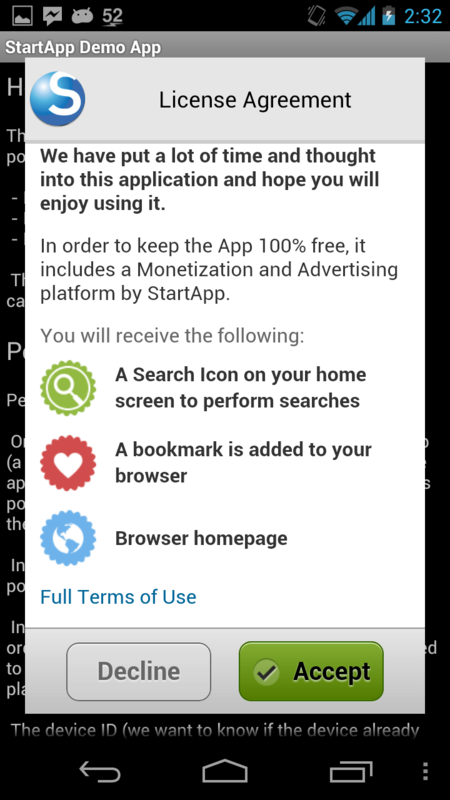 Both the icon and the browser homepage lead to online offer- or app-search walls, provided by Startapp. The full integration additionally adds bookmarks to the native browser’s bookmarks list. So if you have an app that generates a lot of downloads but does not have much display time, this monetization method may be for you. Also if you have an app that has a one-time usecase or if you just want to get a little extra to your traditional income. All together summing up to up to $2,185 per referred developer. If you know a lot of developers that may be willing to use Startapp, this is exactly the way to go. If their apps also have a lot of downloads, what are you waiting for? The third thing Startapp offers are exit ads. Exit ads are fullscreen ads that are shown once an application is closed. They are fullscreen ads for single apps. The interesting thing is that they are impression and not, like usually common, click based. Currently exit ads are in a private beta phase but will be released to the public in about a week. Since I’m not in the group of beta testers, I unfortunately can’t tell you more about this option at the moment. Now that you are informed about the ways of monetization Startapp offers, some words on the SDK. The integration of the SDK is a rather easy process. Since no banner ads are shown anywhere, there’s no need to manipulate layouts in any way. Adding one line of code to the Application object or to the applications launcher-Activity is all that needs to be done on the Java-side, at least for options one and two. In the Android manifest, some metadata must be provided and a Service and an Activity need to be registered. The part that made breathe heavy is the number of permissions: To get the full integration running on a plain Android device (without custom launcher), eight permissions are needed, six of them for the partial integration. Running a quick decompiler over the SDK shows: It is obfuscated, which is not unexpected, since it is a proprietary product. There was a discussion on why and whether it is useful for an ad network to make their SDKs open source with Startapp and Airpush on the Droidcon London. Of course there are pro and contra arguments, I personally like the Open Source version better because I simply don’t like waiting for patches. Looking over their code they seem to collect some data like the device’s manufacturer, brand, OS and display metrics. All in all nothing that would make me not use their SDK. Startapp is a intrusive ad network in the way that it provides advertisements to the user outside of the actual app and modifies the phones environment. Looking at it the other way it is a non-intrusive ad network that keeps one’s application free from ads. I’m not entirely sure which is the preferred way of the gros of users, in the end the decision whether or not to give Startapp a try is on you. When integrating Startapp, I have to say, I was heavily reminded of the old browser days in which you suddenly had a totally different starting page which you, in the most cases, weren’t able to remove. It is not hidden: The app’s description on the Play Store has to include a standartised text explaining that the app can add bookmarks, a new homepage and an icon to the phone. It is opt-in: Whenever a Startapp-Application is first started, a Dialog is shown that clearly lists what the will get when he is accepting to use Startapp. This dialog is not shown if only the exit ad option has been chosen. It is back-trackable: Whenever the Startapp search is shown, the app that is responsible for the install is mentioned on the page. If you know a bit about the topic, you probably already realized that by this steps, Startapp is compliant to the Play Store’s Content Policy Requirement. Startapp is, undoubtedly, offering an alternative monetization solution to conventional banner ads. It may be seen as intrusive, and there are reasons for that. Still, there also are reasons why Startapp is where it is today. So if you are an android developer, feel free to try take a look at it. Also, please feel invited to share your opinion on Startapp and similar networks. I’m sure they will read your comments. Hey, whats about Antyvirus apps? Many users report that startapp constains malware, rating is goiinnnggg down ;/ I think they should solve it. I have 80k downloads per day and I have tried startapp but bad reviews can destroy business. is there a way to give users the option to not use StartApp? If they would prefere, they could go with normal Ad banners. This would make integration to existing Apps a lot easier and user friendlier. Of course i would integrate Ad banners myself. I think it’s mandatory to show the users the dialog to opt out on the first start of an app that uses startapp. I cannot belive why networks like this haven’t been banned from the Android OS. For me, an App that changes my browsers homescreen is an absolute NO-GO, as are Push-Notification Ads like the Airpush crap. Both networks should be banned, since every user that becomes aware of it just hates it. There you go, now they are banned.